Since September of 2013 I got into jewelry making which isn't something I've done since I was a tween. Being a graphic designer and sitting behind a computer pressing keys and moving mice is normally what I do. Therefore it's great to break it up by doing some non-digital art with my hands and tools. Since then I have read a lot of articles about how to sell your jewelry online and in person, some better than others. Two I recommend: Handmadeology.com, and Etsy Blog. I also highly suggest learning about guerrilla marketing. I decided after almost a year to put together my own list of tips and tricks for getting the word out there about the jewelry you make. This will be a work in progress and something I will continue to add to over time. Make jewelry you like or want to see - This makes it fun and not a job, this makes it a passion and not a pressure. Chances are what strikes your fancy also will for someone else. Test out your products - The most knowledgeable person about your jewelry should be you, and the best way to do that besides creating it is wearing them in day to day life. You become a walking ad for your art and you also get to test out the jewelry during daily wear and tear. Does it hold up? Keep it's luster? Do you get any compliments for it? I've saved time and money by having friends wear/use my items to see what can make them better. Having good pictures is the MOST IMPORTANT THING - Think about it, when you are looking at a product you want to be able to see it as best as you can. Whether you are selling them through an online store or just posting pictures on social media to spark interest...a good clear well lit picture is the most important thing. Always be sure to update your product with a new photo. Also, there's no shame in doing color and lighting alterations to your photo. Just don't go overboard. I have actually seen a lot of people who over Photoshopped an image as if they were trying to make it look good. Make sure to have images of your work out there and accessible - Have a photo gallery, or a Pinterest page dedicated to pictures of your jewelry. This is great especially because sites like Etsy have a limit of product pictures you can upload per listing. This is a great way for potential customers to see more of what you have. It can also direct traffic to your purchase jewelry. Price your work right - This was the first thing I failed at. I considered what I spent on supplies but failed to acknowledge the TIME I put in. Do not forget to add in time &amp; labor you spent on the piece. Reach out to people in your neighborhood - You'd be surprised how many art galleries, coffee shops or consignment centers are around you. This is a great way to get your work out there and support and get more familiar with your neighbors and local businesses. Be descriptive with your pieces - Think of them the way a friend or person you know might look at them. Don't be shy about describing them in your own personal way, that will make it more unique. Be yourself with your work and that will help you stand out. Give jewelry away for free - Have promotions or contests. Use friends as models for your work. I would suggest even giving away some of your pieces to a friend to wear around (on loan or gift, but I like giving them). Another great thing I have done is submitting some of my jewelry to silent auctions that benefit local charities. Schools, art galleries, and community spaces often do silent auctions. It is great exposure and going to a good cause...you can't beat that. Giveaways are a great way to promote. Have a print out on where you and your work can be accessed - Great time to have a business card that lets them know how to get in contact with you and how they can view more of your work. Use social media sites as a sales tool - This is a great way to keep your customers and people interested in your work updated. I've made quite a few sales just by posting a link and image to something I made on Twitter. But do NOT rely solely on the internet to drive sales, that's just one component. Try new things and update your jewelry making methods - After a while you will get into too much of a routine with what you make. This is a great time to up your game by making your work better and changing the products you use. This will also re-interest potential customers. Never have only one way you sell your jewelry - Don't just sell it online, sell it in person. For jewelry making this is perfect..I often "sell" my jewelry by someone seeing me wearing it while I'm out and about and they ask me where I got it. I happily say "Me" and give them my card or info. Don't just sell on Etsy either. Once you've got momentum look into a way to have people buy directly from you. Listen to what people are saying - If your friends are cheering you on because they like what you're doing, take that in. If you hear something like "Ooh those would really be nice in this color" that's a great chance to make it happen. A lot of times if you make it and once they see it they'll purchase it. If not, there's a really good likely hood someone else will like it. Other people are full of good ideas (color combos, etc). Some of the best things I made were when someone suggested it. 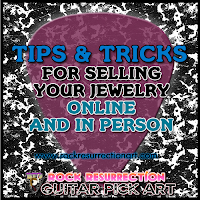 The more time you put into it, the more you will reap the benefits - You just can't expect to post your jewelry online (Ebay, Etsy, Amazon, etc) and have people buy it automatically. That just doesn't work. You will notice that the more time you spend on your jewelry, photographs, and figuring out who your market is... you will prosper. Have a cardboard backing for your jewelry - This makes it so people who buy your jewelry have a way of remembering who made it and where they can reach you for more.